Folks, glad to see this is going mainstream on the Telegraph. We engineers who have followed closely have been aware of all of this for years. As an MSME, and using data mining of EPA air sampling data shortly after the explosions, it is undeniable that at least tens of tons of uranium and plutonium were aerosolized and ended up in reporting stations from Saipan to Guam to Honolulu to San Francisco. Let me show you why this PROVEs beyond any doubt that the explosions were a minor nuclear explosion. They were using MOX fuel which is enriched in plutonium (the stuff bombs are made of). Reactor 3 exploded the most, it was the MOX reactor building. All the fuel is either in a deep vessel called the reactor vessel, or the spent fuel pool which is a huge pool with 80 foot tall walls. If the explosion was hydrogen as "they" claim, then the explosion would have s tarted from the highest points as hydrogen is the LIGHTEST element and floats up. Even if the hydrogen fills the reactor building, it still wouldn't have gotten underneath the fuel rods in the pool or the vessel in order to Launch a huge percentage of them into the air. And by the EPA observed densities in air showing uranium and plutonium dispersed all over the Pacific, we know for a fact that at least ten of tons of nuclear material was launched, maybe even 100 tons. So the explosions came from within the bottom of the fuel pool and/or explosion from bottom of reactor vessel where the melted rods had amassed. Also consider that in all the pictures and videos of TEPCO pumping water to cool reactor buildings, they were never trying to pump anything into reactor 3. Very simple....there was nothing left to cool. We breathed that stuff in. So your powers that be are trying to sell you on the New Nuclear Renaissance, and even this week launching major Propaganda as a movie called Pandoras Promise. Don't fall for it. Protest, show up at meetings, write letters and emails. Show disgust. 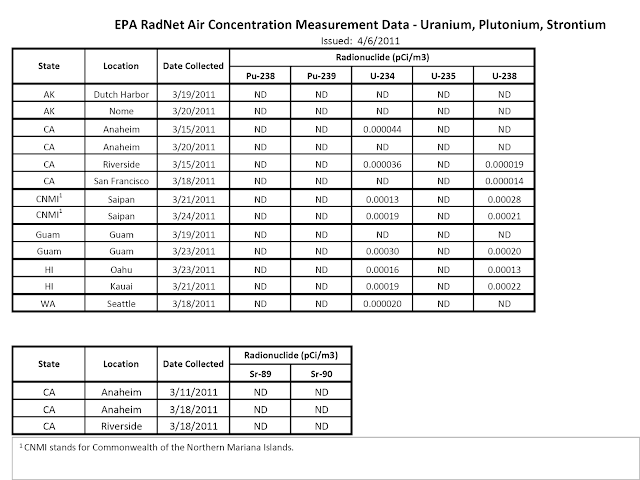 Here is the proof of the EPA air density data showing the extreme aerosolization of nuclear materials. A video showing Unit 3 Explosion, note the massive chunk of concrete which goes to the top of the plume and then falls out to the left.